Interstate Container Cambridge, located in Cambridge, MD, reaches 8th place in the top 25 campaigns for United Way. As part of the corporate mission to continually serve the community, Interstate Container Cambridge contributes $35,276 in support of United Way’s goal to improve quality of life. 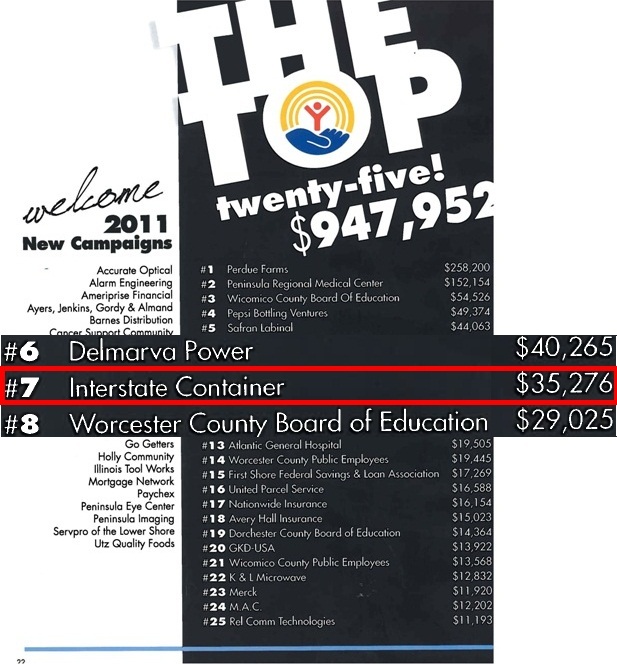 Over four consecutive years, Interstate Container Cambridge managed to raise a cumulative $125,982 to support United Way: 2008 campaign $25,651; 2009 campaign $30,055; 2010 campaign $35,000; 2011 campaign $35,276. The corrugated packaging manufacturer ran a campaign to raise funds through employee payroll deductions, as well as through selling raffle tickets for items, such as flat screen televisions or a day off from work. Funds raised for United Way of Lower Eastern Shore support programs that meet needs of aging and vulnerable populations, and help children and youth succeed, as well as support critical emergency and crisis assistance programs. At the 2011 United Way Awards, held on 27 April 2012, United Way of the Lower Eastern Shore awarded two of Interstate Container Cambridge executives for their efforts and contribution to the cause. United Way also named Interstate Container as the largest supporter in Dorchester County. The event, took place at the Carousel Oceanfront Resort in Ocean City, bringing together members from the community, as well as local organizations. Annually, United Way of the Lower Eastern Shore celebrates community leaders and volunteers from different counties that contribute to United Way campaigns. The United Way of the Lower Eastern Shore, established in 1944, is the largest non-government funder of numerous local non-profit programs and agencies in Dorchester, Somerset, Wicomico and Worcester counties. The nonprofit organization provides support for different local programs which focus on the three main building blocks of a good life: education, health, and income.